Join your RPCVSF Friends at an International Potluck Party! Enjoy Global Fun, Food and Friendship! It's a Potluck Party, so please bring a Dish to Share. Have fun at Michelle Kelsey's home (RPCV: Czech Republic and Colombia) at: 585 Cambridge Dr., Weston, FL 33326. Contact Michelle at 954-682-1944 or RPCVSF@rpcvsf.org, if you have questions. 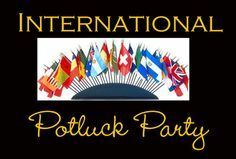 We'll see you at the International Potluck Party!